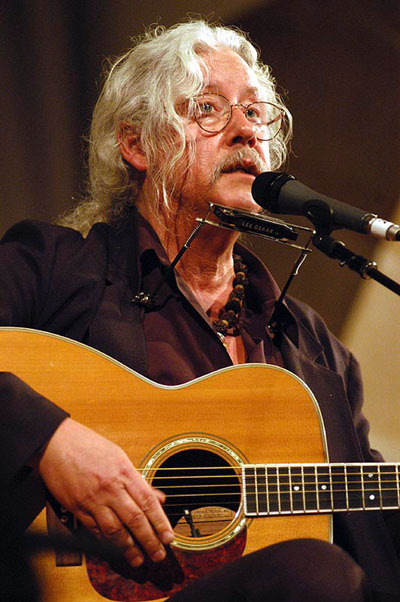 We saw Arlo Guthrie perform in Ogunquit last night. He was wonderful, a witty, and compelling musician. He is the traveling bard, teller of tall tales and entertainer. He is also a link to a tradition, two traditions in fact. For he is born of the Great American Hippy Tradition, for lack of more graceful prose. He performed at Woodstock in 1969. I was fourteen and at camp in Northern Michigan. Camp was remote, but we still learned of the concert that summer. The counselors, young men in their late teens and older, heard about it and passed it along. I recall sitting wide-eyed on my bunk and wishing I was part of that strange and exciting world. Guthrie related how he’d been called on stage at Woodstock a day early, and that he was in no condition to perform, citing the atmosphere at the concert: “A lot of hippies…” The audience laughed. He was sporting long locks of hair, every strand now silver-gray. We were still chuckling when he launched into Coming into Los Angles. The words came to me, to everyone, in a rush and we broke into song, “Don’t check my bags if you please, mister customs man.” Certainly I was not the only one transported to another time and place. 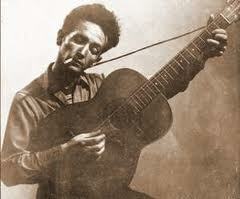 I marveled at the rich legacy on display, these two traditions, Woodstock and Woodie Guthrie, embodied in this one man. It prompted me to reflect on the current paucity of response to today’s challenges, the lack of rational activism, the voices of reason. Where might I now find a community of idealists, let alone the visionary bard? Arlo Guthrie! You know, that reminds me… my Uncle Jimmy promised to introduce me to Arlo way back in the early 70s. At the time, Jimmy claimed to secretly be dating Arlo’s sister. Couldn’t have been for long or else it was a very BIG secret, because I never did meet Arlo. But, I was certainly a fan. How could I not with family in the Berkshires. Did he do Alice’s Restaurant? There was a woman at the back of the room, small room, maybe 150 of us, shouting for Alice’s establishment. Arlo blew her off, saying “We’re only doing songs we know tonight.” Which got a big laugh. She did this after every song. I noticed that Arlo started talking before the last chord even died. Maybe he does this all the time, but he was always talking over her as she shouted it out, Alice’s Resturant. She grew increasingly loud (read: too many Corona’s) until finally, he turned and said, “Hey, how would you like to live a half hour of Groundhog Day over and over.” That shut her up. It was rich. Uncle Jimmy would have got into a very cool clan had he pulled it off. You know, I’m happier to hear that he didn’t sing Alice’s… Carl and I were just saying, how many times can someone sing the same song over and over — and it would be kind of weird to do a long epic song such as Alice — but I was curious. Good analogy has to what it would be like to sing 20 minutes of Alice every time you got on stage! Only 150 people sounds like a perfect size setting. Well, minus one annoying woman!